Have you ever had God speak to you through a really strange event? I had something really, really strange–freaky, in fact–happen to me a few days ago. I was out for my early morning walk/run when I was attacked by a mockingbird. (You can’t make this stuff up!) I was walking down the sidewalk in a greenway area, innocent as you please, when this thing swooped out of a tree and flew right at my head. At first, I thought maybe it was a weird coincidence. But then it came back at me from the other direction… and again and again. It would leave a tree and fly right at my face. It got within a couple of feet each time, and I waved my arms at it to ward it off. It would swoop by me and land in another tree. Then turn around and come back at me again. This happened over and over as I was walking over a decent distance. There was no apparent reason for the attack. I didn’t see a nest anywhere. There were no injured chicks on the ground. It just seemed to come out of nowhere. After I got the message that this thing was attacking me, it scared me a little bit. I didn’t know if it was going to try to peck my eyes out or what, and it flew straight at my head each time. Since there was no provocation, immediately I sensed in my spirit that this was a demonic attack. Then He spoke many things to them in parables, saying: “Behold, a sower went out to sow. And as he sowed, some seed fell by the wayside; and the birds came and devoured them” (Matthew 13:3-4). “Therefore hear the parable of the sower: When anyone hears the word of the kingdom, and does not understand it, then the wicked one comes and snatches away what was sown in his heart. This is he who received seed by the wayside” (Matthew 13:18-19). In this parable, the birds represented the enemy. The Holy Spirit quickened the same thing to me. 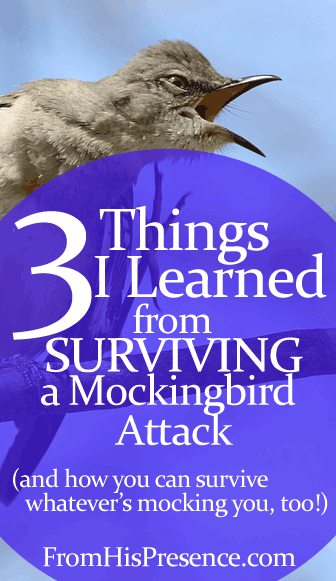 The mockingbird represented the attack of the devil. I had been going through a difficult situation, and the Lord was talking to me about the situation. He also showed me that its name “mockingbird” meant that the attack of the enemy was intended to mock and make light of me if possible; to humiliate me. That mockingbird had no power over me! It tried to hurt me, but it couldn’t… and neither can the enemy. 1. Sometimes attacks will come at you from nowhere. That bird attacked me from nowhere, and kept attacking from behind my back and in front of my face. Sometimes things happen to us in everyday living that come out of nowhere. You didn’t deserve it. You didn’t anticipate it. You just got attacked. Remember this: Just because something is happening to you doesn’t mean you deserve it. Sometimes it’s just trying to derail you or scare you. 2. The attack looks bigger than it really is. You are of God, little children, and have overcome them, because He who is in you is greater than he who is in the world” (1 John 4:4). God is in you, and He is greater than the enemy. God has all power and no equal, and He is on your side. God is fighting for you! Greater is He who is in you than he who is in the world. 3. Forget the attack and run stronger than ever. He wasn’t telling me to flee the bird. He was telling me to forget the bird and be who He’s called me to be with more strength and power than ever before. What are you going through today? What has come at you lately? Forget the attack and run stronger than ever! Put your focus back on God! Strengthen yourself in the Lord, and walk in your calling more strongly than you have ever walked! Display the raw power of God, openly and unashamedly, and forget all the haters that don’t like it! Is it a financial issue, a marriage issue, a friendship issue, a job issue? Is it a demonic spirit like anger, rage, resentment, bitterness, anxiety, or depression? That attack can’t hurt you. It’s just trying to distract you, but you have absolute power over it. Greater is He who is in you than he who is in the world. So choose to run after God. Forget the attack and run stronger than ever. Does this message speak to you about anything you’re dealing with? If so, I’d love to hear how it’s encouraged you; please share in the comments below! Photo courtesy of Ken Slade on Flickr. Photo was cropped to produce the beautiful pin you see above. Sister,…I am GLAD that you know that greater is He that is in YOU because I would have grabbed me a stick and stood in the middle of that Greenway and said I am SHAMMAH (2 Sam 23:11) and it’s time to take it (mockingbird violence) by FORCE. People would have thought I was looney. I would have been so distracted! At least that “mockingjay” would have understood that I was not going down without a fight. Thank God for sisters like you who are quick to hear Holy Spirit in heat of the moment because I KNOW I would have been swift to SWING in a moment like David Thanks for the sharing! Thanks, Venetia! You know, I really love birds but I honestly wouldn’t have minded if I had knocked that thaang out of the sky. If I could have hit it… I did try. LOL. Thanks for reading and commenting as always. 😉 Hope you’re doing well. I love your blog site… it’s my favourite one 🙂 :). Please keep it up, you are soooooo encouraging! I have a bird stories, vultures sit in the woods and hit our sunroom window one Saturday, it startled my parrot and 30 yr. old cockatiel. They were chasing a possum and encircled it. I shooed them off. It was a cruel thing to watch. A policemen showed up out of nowhere, and took pity on the poor creature as I went inside my garage sobbing. I saw one of these things even fly over a pregnant girl. And once, the garbage truck hit a snake and the vulture flew off him. Isn’t it great when the demons turn on each other. I was really sick when the first story happened, I related to the terror of that possum. I really like it better when the butterflies chase me at the mailbox and double rainbows cover my house. Blessings. Good word! We must remember we have authority over our enemies and Satan! Holy Spirit is in me and gives me strength to overcome! Thanks for sharing this word today and reminding us Greater is He that is in me! Amen! We sure do! Hallelujah! Hallelujah ! Great word Jamie and praise God !. I think everyone can relate to this, whether past, present or future attacks come our way. I had robins build a nest on my garage right over the door way. And they would get so mad every time you would open the door, like it belonged to them ? But they would fly away and hide till the danger was over ? I watched them feed their babies. And as soon as they fed them they would fly away. I saw the other birds, small ones would fly up and steal the food right out of the babies mouths ! And the mom and dad robins would just sit on a branch watching their kids being robbed. And they were 3 times the size of these smaller birds ? Dont let the enemy attack you, your family or your freinds ! be on the guard,. As Jamie points out, our God is bigger than any thing else we face ! I have feelings of resentment and anger of other people actions trying to take over my mind and speech. I do. It have to continue letting it peck at me and distract me from my purpose.